Note: This piece first appeared on NATO Review. First, I fled Taliban brutality. Then I spent time in refugee camps in Iran and Pakistan. Finally, I found myself working in Dubai. It was while I was in Dubai that I heard one evening BBC Radio announcing the assassination of the Northern Alliance commander Ahmad Shah Massoud by two Arabs. Two days later, I was watching CNN when I saw a plane crash into the World Trade Center. I thought it was a movie. But then I switched over to Al Jazeera and the BBC. I realised it was real. Some of my Afghan friends were happy when they heard that the United States planned to attack Al Qaeda and the Taliban, who gave sanctuary to Al Qaeda. Six months after 9/11, I had my ticket booked to return to my country after spending years in refugee camps. In the plane, I saw people singing and dancing and celebrating; going home after ten or 15 years away from their families was beyond imagination. We landed back home. Kabul was dusty. All around the city buildings were destroyed, schools and houses were riddled with bullets, and the wreckage of tanks and munitions leftover from the civil war were everywhere. As soon as I entered the city, I heard music playing in shops. I saw children playing in fields. The Kabul sky was filled with kites flown by children. Life was back. I completely forgot all the miseries and destroyed sites which had reminded me of the civil war in unsparing detail. I saw the US and ISAF convoys patrolling in the city, children waving to them as the soldiers distributed pencils and notebooks. In 2002, I went to my village in central Afghanistan to see my parents. Nothing had changed since I was born. My second photostory is about 10 years changes in Afghanistan. This month, Afghanistan marks the 10th anniversary of the start of U.S. and NATO operations to oust the Taliban. The NATO Review asked me to make a photostory to illustrate the biggest changes since 2001. Please find the photostory on this link "Afghanistan's Story in Pictures." In some countries, young people have led in bringing change. In 2010, in Egypt and Tunisia, they toppled the government; in Iran, they have become the biggest and longest threat to the theocratic regime. In Iran, over 60 percent of 75 the million people in the country are under 30 years old. In Afghanistan, according to a United Nations report in 2008, 68 percent are under 25 years of age. Traditionally, Afghan youth as a group have been quiet and never caused trouble. That may be changing. The Tunisian and Egyptian uprisings that spilled over to many other Arab countries have also inspired the Afghan youth. It is said that the Afghan-Chinese relationship goes back to the seventh century when Chinese monks traveled through Silk Road to visit the Buddha statues in Bamyian, blown up by Taliban in 2001. The Silk Road was not only used for a pilgrimage purpose, but also an extensive interconnected route for trade which stretched across Afghanistan and connected the Asia. It was not only for religious and business reasons that monks and merchants throughout the history traveled to Afghanistan; in 1957, Premier Zhou Enlai and Vice Premier He Long visited Afghanistan which marked the beginning of the first diplomatic relationship in the history of Afghanistan and China. Since then, Afghanistan and China ties were bound in formal visiting and nothing remarkable happened until 1963, when a boundary treaty was signed between the two countries. Afghanistan shares a 76km border to its north with China which is known as Wakhan Corridor. However, relations between the two countries were quite gloomy when Afghanistan delivered statements which condemned China for invading Vietnam and also when, in 1979, the Soviet Union invaded Afghanistan; Chinese government condemned the Soviet Union invasion into Afghanistan. Nevertheless, following the September 11 attack which shocked the Western world, the U.S and NATO members dispatched tens of thousands troops to Afghanistan to destroy and dismantle the Al-Qaeda and terrorist safe havens. While the U.S and NATO troops were fighting against terrorists and in the meantime spending billions of dollars, China started piggybacking on the U.S stabilization and democratization efforts by establishing its economic relation with Afghan. Within a few years, not only had Chinese products overwhelmingly occupied the Afghan markets throughout the country, but China started investing on Afghanistan’s mine fields as well. Today, if you walk anywhere in Afghanistan, from street vendors to markets, offices and houses, you would find Chinese products, the stuffs which are made by cheap materials and also sold cheaply. In spite of low quality, the majority of Afghans who have low incomes are buying Chinese products. Afghanistan is also a good market for products from Pakistan, Iran, Russia and Tajikistan, but scarcity of goods and less interest in vesting into Afghanistan opened a gap for China’s products. When Chinese products flooded the Afghan markets, the price for all goods which were imported from neighboring countries faced a dull market. Afghan merchants have often been faced with problems getting visas to travel to Pakistan, Iran and Russia; they have been profiled, delayed or rejected. Even now, it is not easy to get a visa for those countries, but every day hundreds of Afghan citizens acquire Chinese visas at a low fee and in a short time. Of course, it is not only Afghans who travel to China for business reasons; there are many Chinese citizens living and working in Afghanistan. Since 2001, there have been several Chinese construction companies engaged in road construction, building schools and hospitals and several irrigation projects. All of these contracts are either directly made with Western contractees or with the Afghan government, but the monies in which they are paid are all Western donation to Afghanistan. Likewise, there are many Western organizations that have hired Chinese firms for their reconstruction projects. Currently, there are two Chinese companies, ZTE and Huawei, partnered with the Afghan Ministry of Communications to implement digital telephone switches, providing subscriber lines. In addition, China is a major internet service provider of satellite and broadband to Afghanistan. What is more strikingly shocking to the West is that, while U.S and ISAF forces are trying to stabilize the country, China is piggybacking on their efforts and investing in Afghanistan’s mineral resources, in addition to which the NYT recently reported that the U.S has discovered nearly $1 trillion in untapped mineral deposits in Afghanistan. In 2007, the state-owned Metallurgical Group Corp. won a bid to develop the Aynak copper mine, which is in Logar province. It is one of the world’s largest copper deposits. In dropping $3.5 billion to develop the Aynak copper mine, Afghanistan has received the biggest foreign investment ever. Moreover, China has also offered to build a power plant and a railroad from China to Afghanistan, which could triple the investment. China does not have military presence in Afghanistan, but China’s contribution to Afghanistan’s construction process has been quite significant. According to BBC, in recent years, China’s ex-gratia payments to Afghanistan reached up to $350 million yearly. In March 2010, Karzai visited China and the two countries signed a number of cultural and economical agreements. From now on, Afghan students are to receive more scholarships than before and Afghan merchants will have fewer problems in customs and importing goods from China. Finally, some eyebrows may raise and wonder about the Aynak copper mine project and how China is taking advantage of Western presence in Afghanistan, but needless to say, according to Afghan officials China is willing to invest more than what it had already invested on the Aynak copper mine. As Afghanistan has enormous energy and mineral resources, especially copper, it seems that China is likely to be one of the main players in Afghanistan’s future and is also likely to be the largest investor in Afghanistan. One of the positive points about the Afghan and Chinese relation is that China does not have any political or ideological interests in Afghanistan, making it more safer for them to surpass their competitors and allowing them to take advantage of those countries which are apparently struggling to stabilize and democratize Afghanistan. On Wednesday, May 18, a deadly NATO night raid on a house that left four dead sparked a massive protest that 12 people killed after the police forces opened fire on a 2,000 crowd. Reports on Taloqan's raid are vary, some say that the four people who are killed yesterday were members of Taliban while others strongly believe they were members of Al Qaeda. I have been watching the Afghan news outlets, probing for details but could not find any detail whether those four people who are killed by NATO were the Al Qaeda members or not. However, the Fighting for Bin Laden's documentary on the PBS website which reveals a lot about the influence of Al Qaeda in northern Afghanistan provides a clue that they might have been linked with Al Qaeda members. Meanwhile 13 others died in a separate incident when a suicide bomber drove an explosive car into a bus carrying police academy trainers in Nangarhar province. These incidents are wracking the country while NATO forces are planning to hand over some areas to Afghan security forces. In a country like Saudi Arabia in which media is controlled by the Kingdom, blogs have become an alternative source of news and opinion in recent years. Saudi is ranked second in the Arab world for having the most bloggers, trailing only behind Egypt. According to BBC, the number of Saudi bloggers (both male and female) was between 500-600 in both English and Arabic. Like many other Middle Eastern countries, Saudi Arabia is restrictive in its blogosphere. In 2008, Fouad Al-Farhan, a well-known blogger was arrested for his criticism of the government’s corruption and his call for political reform. In 2011, in the wake of uprisings in Tunisia, Egypt and other Middle Eastern countries, Saudi government enacted stringent new regulations forcing bloggers to register and obtain government licenses in order to publish online. According to this law, all Saudi news blogs and electronic news sites now must be strictly licensed, and are required to “include the call to the religion of Islam” and to strictly abide by Islamic sharia law. Human rights activists and bloggers have reacted to government’s decision on limiting freedom of expression. The Committee to Protect Journalists (CJP) is already concerned about the new regulation, which was issued at the beginning of 2011. The CJP has voiced its concerned and has asked the Saudi government to listen to its bloggers and respect their freedom of speech. Here in a program directed by Riz khan on Al Jazeera, young Palestinians and Israelis face off in a debate about their past, present and future. What do they think about their leaders, and do they think they will see peace in their lifetime? It seems that to Israeli youth the pain of Palestinians are not quite understandable. Palestinians have suffered from multiple losses, including losses of territories and also human beings since the formation of Israel in 1948. On the other side, Palestinian youth are complaining about the way they are treated by the Israeli soldiers and settlers. Rez khan has done a great job bringing these youth from both sides together to talk about their issues. Without a doubt, this kind of debate would have impact on both sides and would be important to pave the way towards negotiation and peace. What these young people hope to achieve is peace for both sides. Both have shared pains, but the new generation should take initiatives towards peace. Last night, the 60 minutes report, raised questions on the accuracy of the Three Cups of Tea. According to CBS, the show "also checked on schools that Central Asia Institute claims to have built in Pakistan and Afghanistan and found that some of them were empty, built by somebody else, or simply didn't exist at all. The principals of a number of schools said they had not received any money from Central Asia Institute in years." CBS also said that the dramatic stories in the best-selling "Three Cups of Tea" have become the source of speeches Mortenson is paid to make and the partial basis of nearly $60 million in donations to the charity he founded. In 2009, while I was at Duke University on a media fellowship program, I was invited to talk on the situation of Afghan children to Carolina Friend School students in Durham. In the end, one of the teachers gave the “Three Cups of Tea” as a gift. I heard about the book before but never read it. I later on read the book, although the book encompasses fascinating stories and sometimes inspiring on humanitarian efforts, I found something different compare to what I had been hearing from others. I thought the book a fiction not based on personal experience of the writer. It was hard for me to believe that he made schools for girls in a very dangerous and volatile zone like Kunar province. When last night I watched 60 minutes report, it made sense to me to understand the book that the story is really fabricated. Here the 60 minutes report on the fraud book called Three Cups of Tea, by Greg Mortenson. Daunting news from Egypt in post-mubarakism surprised the world by jailing a blogger for three years. It shocked people because even in the Mubarak era, jailing bloggers was not as common as these last two months after Mubarak was forced to leave the power. The only and the first case during Mubarak was Kareem Amir who was sentenced to 4 years in jail because of allegedly insulting Islam and Husni Mubarak. According to BBC, Maikel Nabil was arrested last month for blog posts where he criticized the role of the Egyptian Army during anti-government uprising. Based AFP, a military court sentenced him to three years in prison. The Maikel Nabil case harks back to Mubarak era; it seems the Army is still remaining in its authoritarian nature and it would likely be hard to expect changes in institutions like the military. It clearly tells us that Egyptian Army does not tolerate criticism and it raises lots of unanswered questions about whether people’s efforts would finally succeed to a democratic society or not, was it worth it to sacrifice and how much power people have to change the governmental institutions. Anyway, the Maikel Nabil case is shocking and it makes the world look at post-mubarakism with doubt. 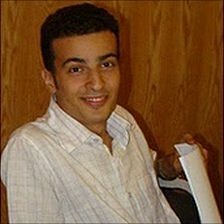 Those who understand the nature of the Egyptian authoritarian regime which was headed by Husni Mubarak over the past 30 years will understand the nature of the Egyptian military and its court sentence for an internet activist and blogger of three years imprisonment. We should not forget that it was Egyptian bloggers who were at the forefront of uprising since the beginning of uprising. I shall later write a separate piece more specifically on the role of blogging in the Egyptian revolution. It was the famous blogger, Khaled Said who was dragged from a cybercafe out into the street and beaten by police which led to his death. His death on June 12, 2010, outraged Alexandria’s residents and ultimately inspired many to stand up against Egyptian authoritarian regime which was headed by Husni Mubarak. Once again, even today, when in the case of Maikel Nabil proved that blogs continue to play an important role among traditional media, which is controlled by the state, but ultimately the uprising was caused by the bloggers who had relative freedom but not without intimidation and serious threat to their lives. Finally, after heartbreaking news from mass murder of more than 1,000 people in Ivory Coast, we have got some good news on UN and French troops humanitarian intervention in that country. According to BBC, the UN has said that three generals loyal to Ivory Coast's besieged President Laurent Gbagbo are negotiating terms for surrender in return for guarantees of safety for him and themselves. Also, for the past days, thousands of people crossed the border to take refuge in Liberia. In meantime, the The U.N. High Commissioner for Refugees, Antonio Guterres, has warned that the dispute in Ivory Coast could destabilize adjacent Liberia. Obama has also issued a sternly worded statement for Ivory Coast's besieged former President Laurent Gbabgo, saying: "To end this violence and prevent more bloodshed, former President Gbagbo must stand down immediately." The humanitarian intervention of Western power commits a double standard if they do not intervene in Ivory Coast to stop the massacre. People believe that the Western intervention on Libya is based on some benefits rather than a humanitarian intervention. In Ivory Coast, there is a massacre going on right now where 200 UN peacekeepers are not capable of preventing a mass murder. According to aid agencies, at least 1,000 people have been killed in an act of mass murder by forces loyal to President-elect Alassane Quattara. The news came out just a few weeks after NATO’s intervention in the war in Libya. 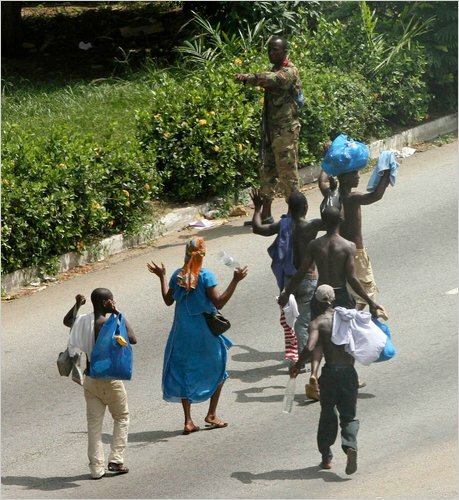 One would ask why do NATO allies not intervene in Ivory Coast to stop the massacre? Well, let’s see what will happen in the next few days. French troops have already taken control of the airport in the commercial capital Abeidjan as the fighting continues in the country. The answer to the aforementioned question is quiet clear. The countries involved in Libya’s war are taking aim to protect international commerce, mainly oil. As unrest in Libya continues, oil prices rose to their highest point since 2008. This is the biggest concern of those countries that benefit from Libya’s oil. In Ivory Coast nothing is significantly important, at least not in terms of economic or strategic value. Geographically, Ivory Coast is located in West Africa. Ivory Coast is considered one of the biggest cocoa and coffee producers in the world. The country has a potential of an economic take off, but until the political crisis is resolved, international investors would not dare to invest in the country. 1. The role of Twitter in coverage of Iranian elections. 2. Twitter in Tunisia and Egypt which help protesters organizing their protests and finally we unexpectedly saw the demise of authoritarian regimes one after another. Here is a fascinating video of some important figures telling why twitter is important to them. The recent uprisings in Tunisia, Egypt, and seemingly sweeping across the entire Middle East have definitely shocked the world. No one was expecting such cataclysmic movements one after another. However, these uprisings also give a new picture of the Middle East to the world, especially to Western countries - a new picture that encourages people in the West to no longer see the Middle East as Israel or Palestine, but as an original Middle East, a larger area with relatively cohesive and in some part homogeneous people living with the same culture and religion. Young Middle Easterners have proven that they can change their fate and shape it to their wills. These people no longer tolerate living under tyrannical regimes, and the most important things we have sees in these uprisings are the demands of freedom. In these uprisings, hundreds, maybe thousands of people have been killed so far; nonetheless, as the revolutions in Tunisia and Egypt triumphed in striving for democracy and freedom, they proved that no one can take away people’s freedom, even if you can kill a few of them. Returning back to the subject, for the past decades, the only thing we have been hearing and reading about the Middle East was the conflict between Israel and Palestine. In many institution of higher education there are branches specifically teaching students about Israel and Palestine conflict. From now on, this could change; scholars would suggest studying a broader perspective of the Middle East. According to a recent news report, the Iranian government jailed two opposition leaders alongside their wives on Sunday, February 27. Mir Hossein Mousavi and Mehdi Karroubi had been under house arrest since the February 14th demonstration. The protest on February 14th, called 25Bahman, was organized by Green movement in sympathy for Egyptian uprising but was cracked down by the government. As Iranian government put more pressure on oppositions, there is some news about the outbreak of a widespread protest tomorrow across Iran. Social networking sites which belong to the Green movement say that tomorrow will be an important day for Iran - an important day on which people would have a peaceful demonstration against the government that jailed their leaders. Tomorrow’s demonstration coincides with Mousavi’s birthday. The Green movement website has already announced that the tomorrow’s demonstration will follow the same pattern as February 14th and will likely continue until their leaders are released from jail. According to the BBC Persian website, which quoted from the Green movement website, as nightly protest began, the anti-government slogans have already been heard from Tehran and many other provinces. The Green movement has asked its supporters to peacefully march through streets and reach the squares. It also emphasized that protesters should remain in public places and squares until their leaders Mousavi and Karroubi are released. It seems like a ridiculous weekend so far. On Friday night, I twisted my knee while I was playing soccer. The ground was quite sticky so I couldn’t turn my body as quickly as I normally would but my weight went on my left leg and tweaked at 90 degrees. My body was spontaneously rotated and rolled on the ground like a rock loosens from its bed and rolls down the valley. First I thought I tore my ACL or tendon, but when I saw part of my knee had popped out, I pushed it back into its usual place. It went back amazingly but the pain has not gone yet. I start walking for little bit when suddenly it popped up again and I again fell to the ground. This time, I could not move my body, so one of the soccer player called emergency and I was taken to the emergency room at Carlisle regional medical center. It took me half an hour to do the paper work- imagine if this were to happen to someone who was in a very critical situation, what would it look like. I was pushed in a wheelchair and a nurse drove me to a small white room with a bed. The nurse wanted to help me to lay down on bed but I jumped up on my own and she laughed at my quick jump. I tried to convince myself that I am not that vulnerable. I have been through many kinds of difficulties, and these things are minor things I can easily deal with it. The doctor came in and checked my knee and assured me that it is not serious; the nerves and muscles had compressed. He advised me to stay off of the knee as much as possible. The nurse brought a pack of crushed ice and wrapped it around my knee, I felt good and was released after almost an hour. When I checked the bill, they had charged me $290, just for touching my knee for less than two minutes. It gave me a sense of understanding of what capitalism means and how I must survive in this country. I am trying my best to stay healthy, running and doing workouts just to repel any kinds of illness. Now, I am afraid of getting sick here. It is unfortunate that I’ve also suffered from a ganglion cyst for the past two weeks. That was caused by an incessant period of damn guitar practice. Now, besides crippling, I suffer from a pain in my wrist, especially when I start typing- it torments me like a hell. Why Egypt is so important to Afghanistan? I have been following the Egyptian uprising closely, and besides blogging I have been tweeting constantly. One would ask why I am so curious and care about Egyptian events, which have seemingly nothing to do with my country. Well, the answer can be anything, particularly including the fact that Egypt is influential on regional level and, more importantly, in Muslim world. It is not clear yet whether these upheavals will put Egypt in a crisis or lead to a prosperous situation However, in any case, changes in Egypt will impact the Muslim world in general and Afghanistan in particular. According to the BBC, since the 1950s, Afghanistan and Egypt have had a long cultural relationship; there has been a formal educational exchange contract between the countries. Since that time, thousands of Afghan students have been sent to Al Azhar University to learn religious subjects. The most obvious impact of Egypt is the birth of the Afghan Muslim Brotherhood party, which was founded by those students who had studied in Egypt in 1950s. They were inspired by the Muslim Brotherhood in Egypt. Today, there are more than 250 Afghan students at Al Azhar University. Ironically, the Afghan government did not pull out these students during Egyptian uprising, though every other foreigner from around the world was pulled out by their governments. More importantly, the Afghanistan constitution is mostly based on the Egyptian constitution and Egyptian thinkers have been very influential among Afghans. Finally, the most striking impact of Egyptian upheavals on Afghanistan would be the weakening of Islamic fundamentalism because it originated in Egypt and it would fade there. Afghanistan has not been the source of any Islamic fundamentalism movements, but of course it has been a place in which extreme movements could easily grow and wrack and ruin the country very easily. Have you ever heard the saying "I think, therefore I am?" Well, that is a philosophical phrase said by Rene Descartes, a 17th century French philosopher. He simply wanted to demonstrate his existence and to prove that he is capable of thinking, therefore he is alive. I've twisted the phrase to "I blog, therefore I am." Today, we are in the 21st century and to simply regurgitate what Descartes has already said, we get a palpable meaning of "I think, therefore I am. It goes beyond its existentialism definition. Perhaps Descartes was trying to explore the reason of existence philosophically, but if he had lived today and been able to observe the changes in today's world, he probably would have said something different. He would see how much the world has changed and, with today's powerful mass communication tools like the internet, everyone has the ability to express themselves and demonstrate that they are because they are able to think and create things. We, as human beings, should be different from other species on the planet. What is that? That could be our identity, the identity that Descartes wondered about and inspired him to say that "I think, therefore I am." That is what we are, therefore I am; I am to think, to be productive, creative, and innovative. I am because I can think, I can create, I live better, I change things, I can help others and that can bring changes to him or her. Therefore, I am. I blog about the people, culture, society, and politics, because I am. I blog to express myself, to prove that I am, to prove that I can still think, write, and be creative. I blog to let people know how and what I am thinking. I blog because I am interested in politics, culture, and, more importantly, in the issues of the Middle East and Afghanistan. Of course everyone is in a state of bewilderment, especially those who follow the news on Egypt's upheavals. For the last hours I have been reading some confusing opinion which were saying that Egypt will meet the same fate that Iran did. It is simply an assumption that doesn't necessarily represent or relate to the major theme but it can be counted as a concern. We should not be confused or naively believe in what we hear from news channels. They are still struggling to realize what to do, how to frame their news, what their narratives should be regarding to Egypt upheavals. But one thing is clear to us that all these news channels are trying their best to cover the uprising. One thing has been vexing me for the last few hours that the Western media are trying to portray the Egyptian uprising as a pro-democracy movement. Of course it's up to them what kind of narrative or interpretation they give out to their audience but if we carefully look at those placards and slogans that are expressed and shown for the last days, non of them represent democracy neither Islamic fundamentalism belief that the U.S and other Western countries scared of. One thing is pretty much obvious that the Egyptian protesters are out there mostly because of their daily concerns that they are angry about. The participants are from a variety of socio-economic backgrounds, they mainly focused on a number of issues which are important in their daily life, such as legal and political issues, police brutality, state of emergency laws, lack of free elections and free speech, widespread corruption, economic issues including high unemployment rate, food price inflation and low minimum wages. Now, it is too early to call it Islamic movement or pro-democracy movement. The protesters will is to simply say good bye with a period of widespread corruption, inequality, oppressive and authoritarian regime which ruled by Hosni Mubarak for 30 years after Gamal Abdel Nasser assassinated in 1970.